The Fayetteville Observer was founded in 1816 as the Carolina Observer. It is considered North Carolina's oldest newspaper, appearing since that date except for the years between 1865 and 1883. (The Wilmington Star, founded in 1867, is the state's oldest continuously published paper.) The Carolina Observer was evidently launched by several Fayetteville citizens, of whom Postmaster John MacRae was the principal. For the next eight years, the newspaper had a succession of at least a dozen owners or editors, with MacRae always in some ownership capacity. In late 1824 the Observer was acquired by Edward Jones Hale, a Chatham County native who had apprenticed on newspapers in Raleigh and Washington, N.C. He was the Observer's editor and proprietor from January 1825 to 11 Mar. 1865, when Union soldiers of Gen. William T. Sherman's army destroyed the newspaper's offices. The Carolina Observer's name was changed to the Fayetteville Observer in 1833. Hale, and later his sons, made the newspaper a leading political organ of the Whig Party. In the 1850s it claimed the largest circulation in North Carolina. In addition to political and commercial coverage, the elder Hale encouraged historical writing. He gave many columns to articles by James Banks, a Scottish-born Fayetteville lawyer and amateur historian who traveled widely to historic sites in the state and is credited with a celebration in 1856 that led to the preservation of the Revolutionary War site of the Battle of Moore's Creek Bridge. Hale also started a practice that has immensely enriched historical research in North Carolina: he carefully preserved copies of each edition of the newspaper. Despite fires, invasions, and moves over 180 years, only a handful of editions are missing from the record. In the months leading up to the Civil War, the Fayetteville Observer vehemently opposed secession. Once war began, however, Hale lent his editorial voice to the Confederate cause, breathing defiance even as Sherman's troops marched into North Carolina. Hale played a key role in the election of wartime governor Zebulon B. Vance. During the war years the newspaper was a virtual gazette of news of the conflict, often printing battle accounts and casualty lists from throughout the state. Hale was joined in the business by his son Peter M. Hale in 1850 and by a younger son, Edward Joseph Hale, in 1860. When Sherman's army destroyed their offices and presses in 1865, the entire family moved to New York. Entering the book publishing business as E. J. Hale & Sons, they soon recovered their fortune while turning out a notable list of war-related titles. Edward Joseph Hale returned to Fayetteville in 1883 and restarted the Observer. As Fayetteville became a small city in the 1920s, the paper became an afternoon daily. In 1919 a group of local businessmen bought it from the Hale family. It changed hands twice again before W. J. McMurray of New York acquired it in 1923 and incorporated it as the Fayetteville Publishing Company. McMurray's brother-in-law, Charles S. Wilson, became publisher in 1924. Wilson was deeply involved in the life of the local community. In the tradition of Edward Jones Hale and nearly every other newspaper owner in Fayetteville, he was an inveterate booster of the economy and culture. Wilson was also up-to-date on developments in journalism, beginning his quarter-century tenure as publisher-owner by revamping the paper. He bought new presses and equipment and moved to a modernized building. In the 1920s and 1930s he kept up with advances in technology and newsreel practices, and even during the Depression he tried such innovations as a rotogravure section. The Observer published large, special issues, including a sesquicentennial edition in 1939, when the community celebrated the 150th anniversary of the 1789 constitutional convention in Fayetteville. On his death in 1949, Wilson was succeeded by his son-in-law, Richard M. Lilly, a Fayetteville native and lawyer. Lilly presided over the newspaper's fortunes during a big growth period in the 1960s, when the sleepy courthouse town grew to urban size. The Fayetteville Observer kept up with the growth by moving into larger quarters and launching a Sunday edition in 1957. When Lilly died in 1971, Mrs. Richard Lilly was named chairman of the board, and a son-in-law, Ramon L. Yarborough, became publisher. Under Yarborough's leadership the company established a second newspaper, a morning daily called the Fayetteville Times, in 1973. Four years later the firm moved into a large new plant. In the 1970s and 1980s both papers won numerous awards for community service, investigative reporting, sports coverage, editorials, and features. The Fayetteville Times was among three finalists for the Pulitzer Prize in 1984. By the 1980s the Fayetteville Observer had the largest circulation of any afternoon daily in the Carolinas. The Fayetteville Publishing Company underwent further technological transformations, installing new computerized production systems. In 1990 the Times and the Observer were combined into the Observer-Times, a morning daily. 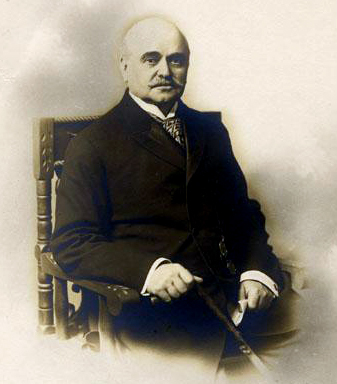 Charles Broadwell, a grandson of Charles R. Wilson, was named editor. In 1997 the newspaper began a $30 million press modernization project. Two years later the paper reclaimed its former name, the Fayetteville Observer, and its status as a morning daily. Thad Stem Jr., The Tar Heel Press (1973). "Fayetteville - Observer." The E.S.C. Quarterly 9. No. 1-2. Winter-Spring 1951. p.24. http://digital.ncdcr.gov/u?/p249901coll22,451988 (accessed September 10, 2012). 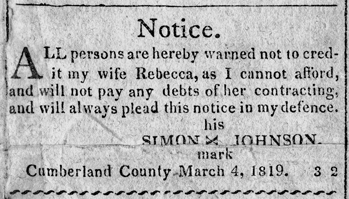 This notice from an 1819 issue of the Carolina Observer is a humorous but insightful example of the high regard accorded newspapers in local affairs early in the state's history. North Carolina Collection, University of North Carolina at Chapel Hill Library. Paton Studios. "Photograph, Accession #: H.19XX.322.70." E. J. Hale. Image from the North Carolina Museum of History.